Cemetarium Haunted House is a Haunted Attraction located in Citrus Heights, CA. Team In-Corpse-A-Rated reviewed this attraction on October 14, 2017. Most of the haunts we’ve attended have been either indoor haunts, tent haunts, or cornfield haunts. Cemetarium Haunted House is a refreshing change for us because it’s the first haunt we’ve reviewed that completely utilizes the outdoors. Located on an empty lot by the Sunrise Golf Course, the cover of night turns this plot of land into a haunted attraction. Along with the signature haunt of Cemetarium, Zombie Heights and Psycho Circus complete this haunted house. On the day we arrived, October 14, 2017, Psycho Circus was closed due to maintenance. This review will solely focus on Cemetarium and Zombie Heights. The casts of both Cemetarium and Zombie Heights were very believable and enthusiastic. The dialogue of Cemetarium was very humorous. Those actors were hillbilly cannibals who would often let us know that we, the guests, were invited to dinner. When we asked, “What’s for dinner?” one actress said, “You’re the dinner!” An actor worth giving kudos was the hillbilly coffin salesman, pitching his coffins for sale in a proud and boastful manner. He offered adult coffins, child coffins, dismembered body part coffins, and any type of coffins we needed. His humorous banter was the most memorable performance of Cemetarium. There was no dialogue in Zombie Heights, because the actors were all zombies. Each of the different actors had their own take on what kind of noises a zombie would make, because some growled, some moaned, and one even snorted. The movement of the zombies was straight out of AMC’s The Walking Dead. Kudos to the first zombie girl we encountered at the start, and the last zombie girl at the ending, because their intensity was the most memorable. The performances of Cemetarium were humorous and engaging, but the performances of Zombie heights were intense and aggressive. Every actor fulfilled their role throughout both haunts. The actors of both Cemetarium and Zombie Heights were wearing appropriate attire for their respective scenes and themes. The hillbillies in Cemetarium had typical redneck clothing, and the zombies wore tattered and dirty clothes. The zombies wore makeup, which was OK, not great. There were two-line actors outside of the haunts who wore the best makeup, a military soldier in camouflage face paint at Zombie heights, and a black and red demon at Cemetarium. No masks were used in either haunt. We found the two haunts of Cemetarium Haunted House to be very safe. Most of the walking path was on the earth, but at various spots, walking ramps were provided to navigate through hazardous terrain. Cemetarium Haunted House is a tough place to find. You need GPS because it’s not obvious while driving by it. The ticket booth has a large banner with the haunt’s name attached to it, and the individual Cemetarium haunt has an archway with the haunt’s name in dim blue lights. The only queue entertainment is line actors interacting with guests, but we only spotted one for Cemetarium and one for Zombie heights. There’s no room for a centrally located performance focal point. The only extras we saw were porta potties; no concession or souvenir stands. There was no music or sounds outside of the haunted house. We saw neither banners nor sidewalk signs as we drove to the location. It’s so dark, that the only clue we had that we arrived was the line of attendees waiting to get inside. The only sound effect that really stood out was the music playing at various parts of Zombie Heights. It was an instrumental heavy metal song that sounded like the soundtrack to an action movie. We did see an animatronic not functioning in Cemetarium that looked like it was supposed to lunge out at us, but there was a human head bobing up and down in a cooking pot. This haunted house is very “Old School,” and doesn’t utilize high-tech special effects. Cemetarium’s scenery successfully conveyed a rural hillbilly community, with the façade of a house with a front porch, a living room, kitchen and numerous hallways; each are well detailed. Mind you, that this is still an outdoor haunt and all of the scenery is outside, but it works! The scenery of Zombie Heights shows abandoned and demolished building structures and cars. Walking through Zombie Heights made us feel like we entered scenes from The Walking Dead. Lighting was used in a subtle manner to naturally light every scene. 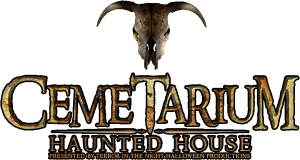 Cemetarium Haunted House consists of three haunts, each with an independent theme. Zombie Heights is a zombie apocalypse theme, Psycho Circus (not open when we came) is a killer clown theme, and Cemetarium is a hillbilly cannibal theme. To tell you the truth, Zombie Heights was the scary haunt, and Cemetarium was the humorous haunt. Actors in both haunts would engage a group of customers, but then go for a second scare as the group would walk away to the next scene. As a result, the back of the group seemed to get the most attention. Cemetarium’s approach to scares was telling the audience that they’ll be beaten. However, a hillbilly tapped his fingers on a wall with aluminum siding which made a pinging sound that startled us. There was also a stack of steel drum barrels that started making pinging sounds as we walked by, which also caught us off guard. Zombie Heights had aggressive actors who would lunge and growl at us. They had a mean and intimidating demeanor. You can see the influence of The Walking Dead with their approach to scare tactics. Cemetarium Haunted House took a total time of 18:02 minutes to walk through. 13:26 minutes of that time came from the individual Cemetarium haunt, which for us is the longest time spent in a single haunt maze. At a General Admission price of $22 for two haunts, that calculates to 0.82 minutes per dollar, which is very good value. The General Admission price for all three haunts is $32, but since Psycho Circus was closed, we couldn’t fairly calculate the value of all three haunts. Cemetarium Haunted House effectively uses all available space and there are no “dead spots” that need to be filled.